…When will it open, you ask? I do not knowâ€” but I am going to keep swinging by until I can find someone to ask! Today I found out. 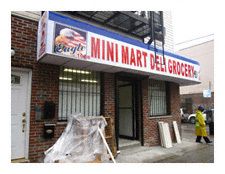 Per the owner (who was busy overseeing the installation of shelving and refrigeration units) the Mini Mart Deli Grocery will be open in “10 to 15 days”. That’s not too far off, folks. From what I saw he is already stocking up on nonperishable sundries and has had a menu drawn up outlining what food stuffs will be made to order. Think the usual fare: egg sandwiches, bagels and the like. Although my enthusiasm about this establishment has not been shared by some, I for one will be delighted with not having to schlep to India Street in the dead of winter for a package of maxipads. It’s the little things which make life worth living.